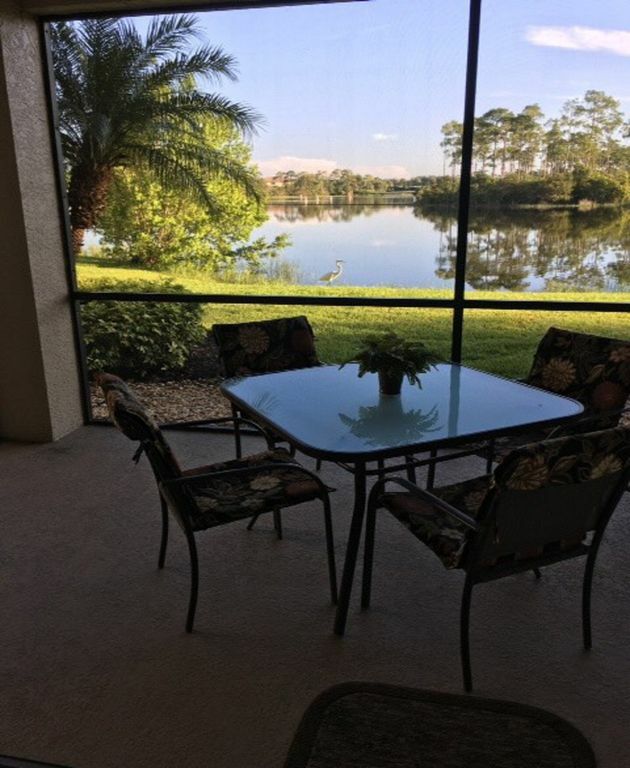 Picture yourself sitting on the lanai overlooking a breathtaking view of the lake, just steps away from your door. Your condo offers the best value in Florida living as part of a beautiful 547 acre planned community with Mediterranean-style architecture, beautifully landscaped with seasonal flowers, swaying palms and manicured lawns. Your condo is a first floor unit which gives you access to both your unit and the outside beauty. This condominium is beautifully furnished with all the amenities to make your stay enjoyable and unforgettable. This unit offers 2 bedrooms (a king bed in the Master suite and twin beds in the 2nd bedroom), 2 baths, kitchen, dining room, living room, laundry, and a screened lanai. There is even a queen sleeper sofa in the living room for that extra guest! A swimming pool, heated spa and grills are just a short walk away from your door. Pelican Sound is just 20 minutes from Southwest Florida International Airport in Fort Myers and 20 minutes from lovely historic Naples. It is 5 minute drive to I-75 and the Miramar Outlet Mall, as well as near professional sports venues, movie theaters and a wealth of fine restaurants. As a tenant leasing in Pelican Sound, you become a member of the Pelican Sound Golf and River Club. As a member of the golf club you will have guest privileges to the 27 hole championship golf course. Practice facilities are available, including a aqua driving range. You can stop at Pelican Sound's 19th Hole, which consists of an 18,000 square foot club house which offers a full range of amenities including casual and formal dining, a grill room and bar, a golf pro shop and men's and ladies locker rooms. A 5,000 square foot river club is also available for water-themed fitness and activities, has a casual restaurant with indoor and outdoor dining, a lounge bar, fitness center, a 2,400 square foot swimming pool and a full time activities director. Five additional pools and spas are available throughout the property, with miles of jogging and bicycling routes. The club's tennis pro oversees the 6 lighted Har-Tru tennis courts, including tournaments and a full schedule of lessons. Pelican Sound also offers a complimentary boat shuttle service to Lover's Key State Recreation area several times a day. You can relax on the beautiful sandy beaches of the Gulf of Mexico. There are also complimentary canoes and kayaks available to boat down the Estero River and enjoy the scenery.